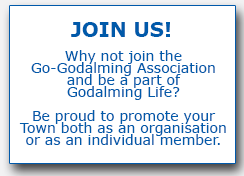 What does The Go-Godalming Association do? The Go-Godalming Association was founded in May 1994 to promote and co-ordinate cultural, social, commercial and other activities in Godalming for the benefit of the inhabitants and visitors to the town. Go-Godalming is proud of its success and everything our members and volunteers have achieved. Established Godalming in Bloom to promote and celebrate gardens and horticulture in the town. Established a 'sports council' through Sport Godalming which actively encourages participation in sport and leisure, and has successfully campaigned for the provision of access to local facilities and improvements in services. Encouraged the Town Council to examine the development of an "Open Air Entertainment Space"
Developed a pilot "Shopmobility Scheme"
Brought Father Christmas to Godalming! Co-ordinated the refurbishment of the bandstand near the Philip's Memorial. * unfortunately our Welcome Packs have now been discontinued due to GDPR but over the years up to May 2018, over 5,000 packs have been distributed. The financing of our Association is crucial to our continued success. We have no regular income other than subscriptions paid by the people of Godalming. We had 122 supporters as at January 2018 from many groups including Education, Churches, Leisure, Voluntary Sector, Retail, Professional and Financial Organisations, Special Activity Groups and many individuals. The annual subscription is only £5 for each individual member and only £10 for each organisation.